I had to share about the most adorable shoes I got from Adidas! 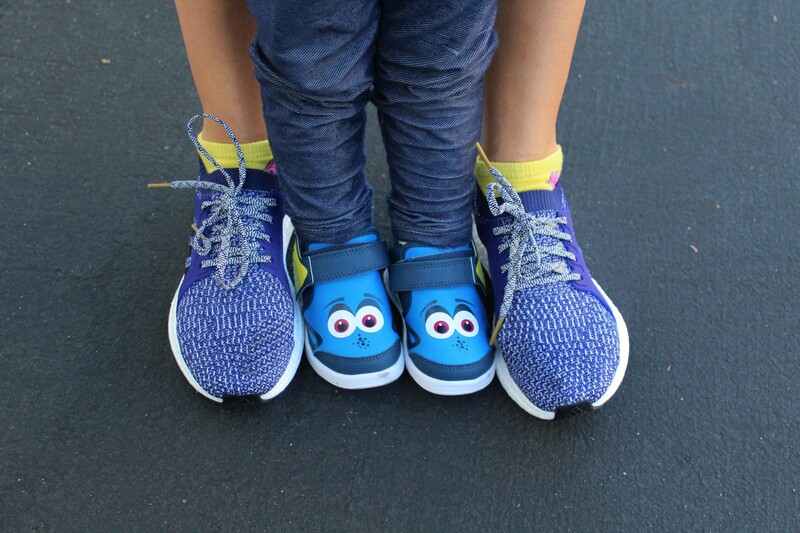 My daughter, who wears toddler sizes, was able to get Dory shoes! Not only are these super cute, complete with Dory’s yellow fin as the strap to fasten, but they are incredible comfortable. The material feels flexible and soft, and often when we go places that involve a lot of walking (such as Disneyland), she wants to take her shoes off. The other day, we did Disneyland from morning till 9:30pm, and she happily kept them on the whole time! And of course being friends with lots of Disney fans, have been getting a ton of compliments on them! I was lucky enough to snag a pair of these limited run toddler shoes, but Adidas has lots more Disney products and other adorable toddler shoes here! And since my sweet daughter and I are besties, we had to coordinate! I received Adidas Running UltraBOOST shoes in Ocean Blue! I so often have the problem of shoes not fitting tightly enough around my foot while running, and my heel rolling. These shoes fit around foot snuggly yet comfortably, and feel incredibly soft. It is definitely the moist unique running shoe I’ve ever owned, and I was able to wear to workout hard in them taking them right out of the box! We are definitely a happy mother/daughter duo running around Disneyland together, and many other countless adventures that involve being on our feet! You can find the UltraBOOST Women’s running shoes in ocean blue here, The Dory toddler shoes were part of a limited run, but you can find other toddler shoes and Disney shoes in the Adidas infant section. They do run out of stock from time to time on this popular item, so keep on the lookout for them!